According to state records, diesel spilled from a tank on the site of the Naval Support Activity site in August, went into the drainage system and was discovered in the Florida Avenue Canal. In early August, hundreds of gallons of diesel leaked from storage tanks located at the abandoned Naval base in the Bywater neighborhood into nearby waterways, documents from the Louisiana Department of Environmental Quality show. The fuel spilled from an above ground container onto the soil below, seeped into the drainage system and traveled approximately two miles to the Florida Avenue Canal. After discharging into the canal, the diesel flowed another half mile into the reservoir of a Sewerage and Water Board drainage pump station. According to a DEQ incident report, contractors working for the Army Corps of Engineers first noticed an oily liquid in the Florida Avenue Canal on August 1, and contacted the U.S. Coast Guard’s National Response Center. Along with Coast Guard emergency workers, crews from the Sewerage and Water Board’s Department of Environmental Affairs, Louisiana Department of Environmental Quality, New Orleans Fire Department HazMat Unit, Department of Wildlife and Fisheries and a private contractor called OMI Environmental Solutions were dispatched to the site to cleanup the spill. By August 9, emergency personnel finished cleaning up 1,700 gallons of “diesel/water mixture” and 18 cubic yards of contaminated debris. Several turtles and ducks were impacted by the spill. And the Sewerage and Water Board pump station temporarily shut down to prevent polluted waters from being pumped into the Industrial Canal. Sewerage and Water Board investigators traced the spill several miles back to the property formerly known as the F. Edward Hebert Defense Complex, at 4400 Dauphine St., and contacted its current owner — the City of New Orleans. In their report, investigators noted the site’s abandonment and that “the incident could have been preventable if diesel fuel had been removed from the above ground storage tanks.” They also determined that “trespassers scrapping material” caused the spill when they removed brass plugs from the containers. Area residents were never informed of these events, but news of the spill comes as no surprise to them. Neighbors interviewed by The Lens said the incident is yet another example of the base’s blot on their community, describing how the once imposing military complex with its high-security defenses has succumbed to extreme ruin and vandalism since the city took ownership in October 2013. 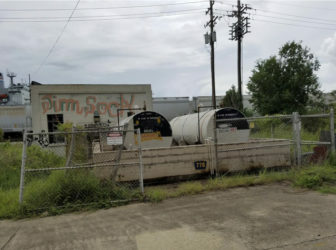 Mayor LaToya Cantrell’s office said it is currently re-negotiating an agreement with a private contractor, EMDRC Partners, to secure and develop the site. Negotiations with EMDRC began in 2012 and were finalized in 2016, when EMDRC signed a lease and development agreement on the property. The lease held the company responsible for the site’s maintenance. However, the city nullified the agreement, Cantrell administration officials said. That was because the city was not in regular communication with EMDRC after the company’s official contact — former Sewerage and Water Board director and Mayor Mitch Landrieu’s chief infrastructure advisor Cedric Grant — was pushed out of office in 2017. After years of being unoccupied and unsecured, the property shows signs of advanced blight. Windows and doors are busted out. Large sheets of metal grates hang tenuously from the top story of the main building. Rusted pieces of industrial machinery and military equipment litter the grounds, alongside used hypodermic needles, discarded clothing and heaps of moldy furniture. “What a beautiful piece of property, and now it’s denigrated. There’s graffiti everywhere. Water gushing. It is shocking the lack of care. But you know what they say, ‘nature abhors a vacuum,’” said 95-year-old Lauren Swinney, who has lived near the base for decades. Joachim Rojas, owner of Bacchanal, a wine bar located directly across the street from the naval base, described it as “dystopian, like something out of ‘I Am Legend,’ ” a post-apocalyptic science fiction movie. Broken doors leave the property wide open to trespassers. But the abandoned site is more than an eyesore to the Bywater neighborhood. Water continuously running from broken pipes has caused street flooding. Trash fires started by squatters grew into major outbreaks in January and September. Since 2016, dozens of crimes have been reported at or around the address. That includes aggravated battery, illegal weapons, arson and burglary, according to online police records. In the wake of the diesel spill, fires and criminal incidents — all attributed to trespassers — the city has taken no apparent steps to restrict access to the abandoned site. Months later, holes in the fences remain, and trespassers are in plain view. “If you’re outside now at the naval base, you can see there’s a stream of people coming and going in and out of there. We’ve all watched these people stealing metal repeatedly and now that the word is out that this is a place you can go and live and steal the metal, this is only escalating,” nearby resident Judy Bolton said. John Guarnieri, president of the Bywater Neighborhood Association, said the city has allowed these problems. “We at this point don’t feel confident that something constructive is going to be done. It’s incredibly dangerous. There could be an explosion or fires. Heaven forbid, somebody gets killed or there’s an accident of some sort, it’s going to be the city’s responsibility,” he said. The crisis-prone site now stands in sharp contrast to the city’s $173 million plan to turn the base into an international Crisis Operations Center. 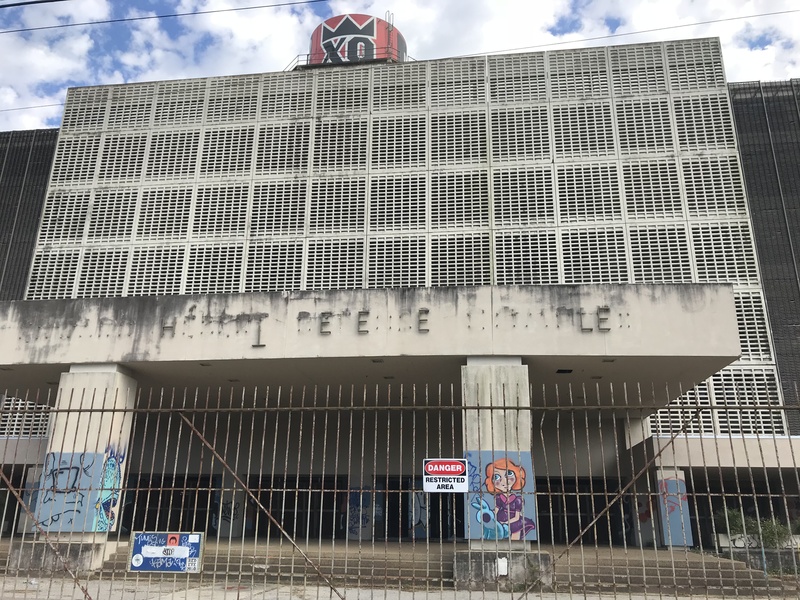 Following the Defense Department’s 2005 decision to close the base, the City commissioned the Naval Support Activity New Orleans Advisory Task Force to submit a bid to procure the property from the federal government. The Navy accepted the city’s proposal to redevelop the site into a mixed-use facility with emergency response services, municipal offices and housing, and deeded the property to New Orleans at no cost in 2013. Belinda Little-Wood, a consultant who served as the executive director of the task force, worked for three years on a development plan. She coordinated a joint venture between the city and a private contractor, EMDRC Partners, which would share in construction costs and planning. And she secured $40 million in FEMA grants to jumpstart proposed renovations. But that money never made its way to the project. In 2015, Little-Wood’s former boss, Cedric Grant, diverted funds allocated for the base to the Sewerage and Water Board, where he served as Director, as first reported by WWL-TV. Reallocating that money put the project in jeopardy, Little-Wood said, because the deal she worked on between the city and EMDRC Partners — which was selected as the developer in 2012 — was contingent on the city investing federal grants as seed money. In October of 2016, the city signed the lease agreement with EMDRC. Developer Joe Jaeger, who heads the company, told The Lens that EMDRC was never informed of the decision to pull FEMA funds from the project. But according to Chad Dyer, Cantrell’s Deputy Chief Administrative Officer for Land Use, the city, under the previous administration, effectively nullified the agreement. When Grant was forced out of his job in August 2017, EMDRC lost its official city contact, Dyer said, and the city dropped communication with the company. According to Dyer, talks between the city and the company stopped at a key time: an 18-month “feasibility period” included in the lease, during which the company could inspect the property, determine if the redevelopment plan was feasible and, if necessary, terminate the agreement. The feasibility period was supposed to include regular communication between the city and the company. In the 2013 Act of Sale, the Navy disclosed the likely presence of petroleum contaminants located in nine above-ground tanks as well as asbestos containing materials, lead-based paints, and medical wastes. It relinquished responsibility for the hazardous materials onto the city following the property transfer. The site was never cleared of environmental hazards left over from the military installation, like the diesel, or guarded against the trespassers who apparently caused the spill. It’s not clear who’s responsible for that. According to Dyer, because of its agreement with the city, EMDRC is the responsible party on paper. “You couldn’t really place blame on the developer because they were not able to negotiate with the city during the feasibility period in that original lease,” Dyer said. Meanwhile, the diesel spill and recent fires have occurred on the base during this period of uncertainty. Cantrell’s office is currently working to broker a new agreement with EMDRC, Dyer said. The city will not dedicate funds to the project, he explained, because the developer will be fully responsible for financing construction costs according to the revised contract, which the city plans to execute by the end of the year. “When we came into office the project was behind about two years. But as of December 31, it will be completely caught up,” he said. Without going into specifics, Dyer said redevelopment plans have been adjusted to account for current realities. Last month, Jaeger told The Lens he was unsure if he will move forward with the deal. “I just work on the construction side of things, and I’m getting to the end of my rope waiting for the city to do its part,” he said. But Dyer said the city and developer are now cooperating to address safety concerns, citing how both parties agreed in recent weeks to lease out the property to film crews, which bring private security details on set with them. Currently, a production company is shooting scenes at the base for a Netflix sci-fi movie about a drug epidemic. Tentatively called “Power,” the film stars Jamie Foxx and Joseph Gordon-Levitt. Dyer said the production company is liable for what occurs on site during the shoots. The spill originated from oil tanks on the property, according to DEQ records. Greg Langley, a spokesman for the Louisiana Department of Environmental Quality, said that prior to the incident, the LDEQ could not force the City of New Orleans to drain the diesel tanks or remediate other possible hazards because the city had not officially declared what it is doing with the property. Environmental cleanup typically happens during construction and varies according to land use, he explained. But that assumes the property is contained, not blighted. Blight determinations are issued by the City of New Orleans Department of Code Enforcement. Between October 2013, when the city took over the property, and the August diesel spill, the city’s Department of Code Enforcement issued thousands code violations to property owners around New Orleans. But after searching city violation records, The Lens could not find one issued to the base property during that period. In September, a month after the spill, a citizen filed a complaint with the city following a fire there. According to city records, an inspector visited the property and found that it was “unsecured/heavily vandalized” and a “public nuisance.” It does not appear that the case has been updated in the following months. Because the city of New Orleans is the regulatory agency that oversees blighted properties, and is not self-enforcing maintenance or safety codes, Bywater residents said they have no recourse for the problems they’re experiencing. Their calls on city officials to fix infrastructural and safety issues stemming from the abandoned site and spilling out into their neighborhood have repeatedly gone unanswered. For nearly a year, Judy Bolton has been trying to get the Sewerage and Water Board and the City of New Orleans Department of Infrastructure to fix a broken pipe gushing water near her house. In addition to the immense cost of water waste to taxpayers, leaky pipes decrease pressure throughout the pumping system, which can cause water contamination. While one of their lesser concerns, Bywater residents see the water leak as a daily reminder of the city’s persistent negligence. This story was a collaboration with WWNO. Listen to the radio version here.